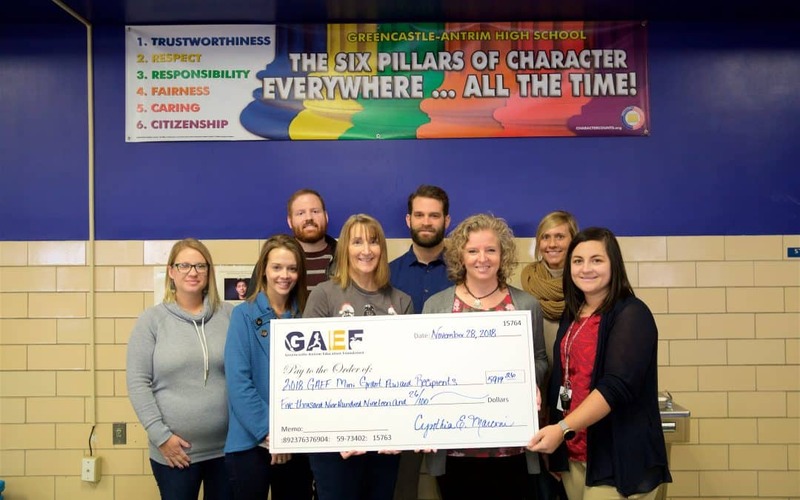 GREENCASTLE, PA: In an awards luncheon on November 28, 2018, the board of directors of the Greencastle-Antrim Education Foundation awarded eight mini-grants to Greencastle-Antrim teachers and counselors. The application process began in September and grants were due in October. The board of directors reviewed and discussed all of the grant applications. “Initially $5,000 was set as the limit for the revamped mini-grant process,” said, GAEF executive director, Cheryl Brown. “We were inspired by all of the applications and felt compelled to go over our intended budget and fund all eight worthy projects. Haven requested “Talk and Type” Logitech headsets with microphones for use by the 4th and 5thGrade English Language Arts Learning Support Classroom. The acquisition of this equipment allows the teacher to better fulfill the access to dictation, as stated in the student IEP’s. The access to dictation will increase student motivation when writing. Student spelling mistakes will also decrease. The use of dictation will also decrease handwriting frustrations exhibited by many students. James and Meagan plan to create a chapter of the Rho Kappa Social Studies Honor Society here a GASD. Rho Kappa Social Studies Honor Society is the only national organization for high school juniors and seniors that recognizes excellence in the field of Social Studies. The mission and purpose of Rho Kappa is to promote scholarship and to recognize academic excellence in social studies among high school students. As school counselors, their unique role is to provide for social, emotional and academic needs of their students. Daniel and Jenniffer applied for a professional development mini-grant to attend Motivational Interviewing. Motivational Interviewing is a research-based technique that is about arranging conversations so that students talk themselves into change based upon their own values and interests. They will be attending a full day introduction training on December 6th. Ronalyn requested a mini-grant to purchase studio equipment for the Studio Recording Foundation Elective. The additional equipment will allow more students to participate in the program and will be a vital part of the portable studio. This equipment will allow students to record and listen to rehearsals which will perfect the sound and help performance groups grow and develop their abilities through using listening skills and becoming more analytical of their pitch, tone, dynamics and overall musicality during a rehearsal or performance. Stacie applied for a mini-grant to expand her library of Game-Based Learning in 7th Grade Mathematics. Game-based learning is the educational concept of using games in the classroom to teach new concepts and reinforce previously taught concepts. The games Stacie will be selecting cover a wide variety of math standards. She plans to introduce these new initiatives in January. Robert and Susan each submitted mini-grants for Ipads in their classrooms. In the classroom setting technology is becoming increasingly important. With increased Ipads in the classrooms, students will be able to utilize technology on a more regular basis. While we couldn’t fund all of the Ipads requested, each mini-grant application was awarded two Ipads with cases and charging station. Ross applied for a mini-grant to cover the cost to take students in the Human Rights Literature course to the United States Holocaust Memorial Museum. Leading up to the trip, Ross will have students study the genocide in Cambodia and then the Holocaust. During the fieldtrip, students will take pictures of exhibits that most affect them and when they return they will put together a one page reflection of the experience. Ross plans to take the students on this fieldtrip in the Spring. “We look forward to hearing back from all of the recipients in the spring and seeing the results of their projects that we funded,” said Brown. To see all of the exciting things that GAEF has planned, follow them on facebook, visit them on their “under-construction” website, or contact the executive director at 717-658-0961.